Cronuts (noun): a new type of pastry created by a French Pastry Chef Dominique Ansel at his eponymous bakery in New York. This hybrid pastry can be described as a crossover between the pillowy donut and the flaky, multi-layered croissant, a perfect marriage of French and American culture. I won't bore you with stories about how globally phenomenal this hole-y rings have become within a short period, because all that can be read from a reliable source, Huffington Post Taste (one of my favourite news portal online). 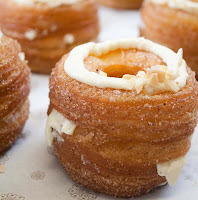 For all news about cronuts, click here. So, Indonesia versus Singapore, who does Cronuts better? 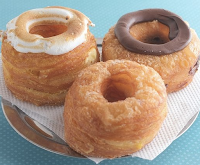 From Indonesia, we have the Cronuts from the Cake Shop at Mandarin Oriental Jakarta, as for Singapore, Gastronomia's Crodos will be the contending candidate. Without further ado, let me introduce you: Cronut vs. Crodo! Even living in New York does not guarantee that you will be able to eat it, granted the queue outside his bakery is constantly a winding caterpillar of people, and on top of that, each person is only entitled to a maximum of 2 pieces of the $5 Cronut™, what are my chances? "The experience of eating a cronut is very different from eating a traditional doughnut. For one thing, the cream is evenly distributed among the dozens of pasty layers, so you never get hit with a giant burst of filing as with say, a creme brulee doughnut from the Doughnut Plant. The extra layers also mean more oil-dough contact, so it's a more oily pastry similar to a fritter—a deep-fried dessert lover's dream." That is exactly what I experience when eating MO's Cronuts. With MO's, I couldn't stop at one piece, whereas with the Crodos, after just a few bites I kinda felt, "okay, I get it, that's enough for me". Sounds irrational, huh? But I believe my foodie friends out there like Umay, Imel and Aline who had tried and written a post about Cronuts would agree that MO's Cronuts are awesome. Given the price versus taste, I'd still lean towards MO's more affordable and foodgasmic Cronuts. 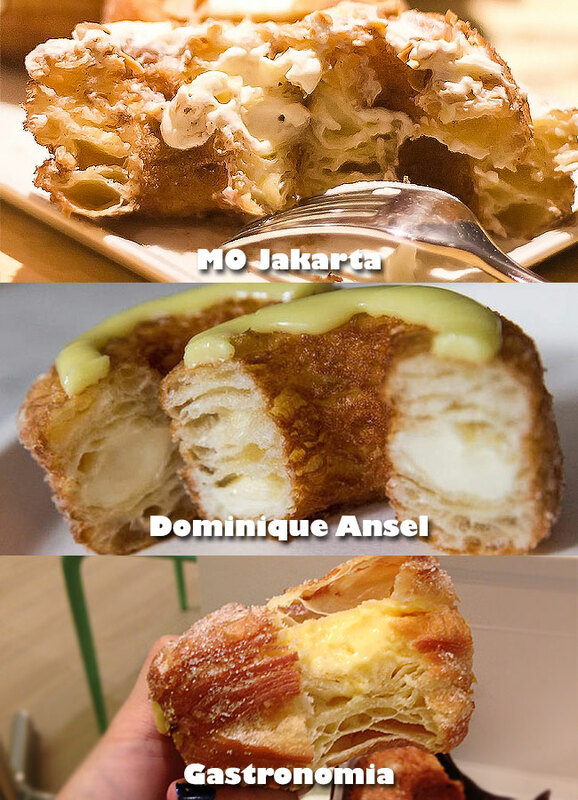 So, the winner is...MO Jakarta's Cronut from Indonesia! Yayyyy! That being said, Gastronomia's effort to create Crodos and even receiving international attention (refer to the "The World's First Interactive Cronut-Finding Map"), IS something noteworthy. So yeah...good on them too! After all, I am always a fan of Gastronomia, and I have professed my love in a post I dedicated for Gastronomia sometime ago. Where else to get Cronuts in Jakarta? Besides from the Cake Shop at Mandarin Oriental Jakarta, you can have a go at Union Brasserie (called Flaky Donut) and Publico. I have not tried the latter two (yet), hopefully sometime soon. For other store locations, click here. A very thorough comparison :D Amazing! Great review, El. I love this kind of thoroughly-examining post hehe. Nice review and very thorough. Will try it for sure. Thanks for sharing. Wow.. i must share you my experience of eating the real cronut in NYC! Maybe I should try the one in MO jakarta to compare the taste as well :) Love this blogpost!